Game of Thrones 243 Ways by Quickfire is a greatly welcomed slot game by the fans of the famous TV series. The symbols in the game are depicted by the various Houses of Westeros. The popular television series has been based on the book by George R.R Martin- A Song of Ice and Fire. Play this slot game at Monster Casino for real money for an unmatched gaming experience. The high-value symbols are the logos of House Baratheon, House Stark, House Lannister and House Targaryen. 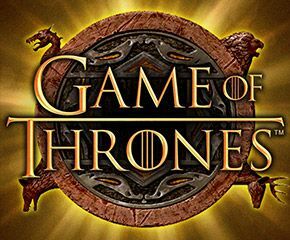 The wild symbol is the logo of Game of Thrones and it can substitute for all other symbols except for the scatter and the scatter symbol is the Iron Throne. The low-value symbols in the game are the playing card values- J, Q, K and A. The wager needs to be set in the first place in order to enjoy the Game of Thrones 243 ways slot. The number of coins that can be wagered is set by pressing “Bet” and after that, the “Coins” arrows can be used to set the number of coins per line. After that, use the “Coin Size” option to change the denomination of the coin. The range goes from £0.01 to £0.02. After you are done with choosing the denomination of your choice, click on “Spin” to set the reels into motion. The “Autoplay” option will help you play for a said number of times. • Gamble Trail Feature – Well, you have been provided with a gamble button that activates this feature. There are four locations on the map and you are to gamble on the side of the coin (heads or tails) that will show up. On a successful attempt, the winnings get multiplied and you move on to the next location. With every unsuccessful one, you reach the last location. 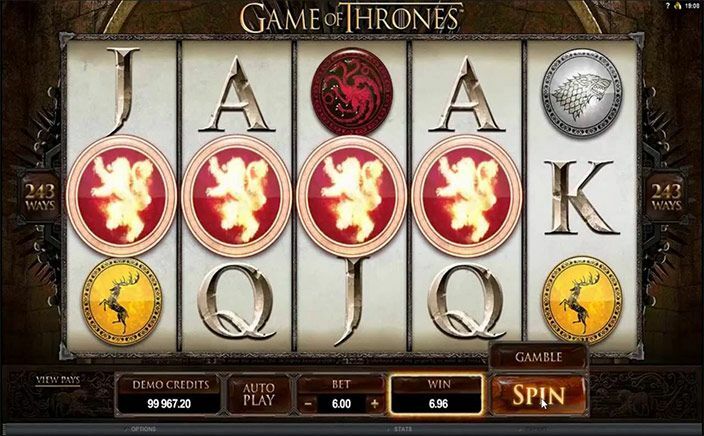 • The Free Spins feature – On landing 3 or 3+ iron throne symbols, you can trigger this feature. You need to choose one of the 4 Houses of Westeros. Win up to 18 free spins in the Game of Thrones 243-way slot. The fans of this television series are bound to have a great time playing Game of Thrones 243 Ways online slots game. The visual graphics are a treat to the eyes. It showcases every character of the show thus bringing out the essence of the show.